Often times we discard our old possessions when they are no longer fashionable. The National Park at Hyde Street Pier in San Francisco does quite the opposite as they take tremendous time and care in the historical preservation of boats. 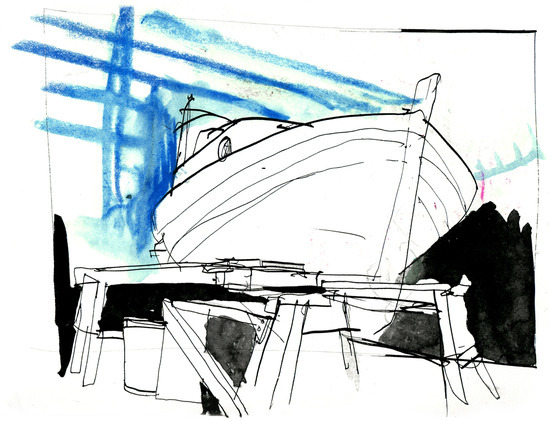 During a recent trip to Bay area, I had been sketching along the pier and had to take shelter from the rain in the Small Boat Shop. I discovered a beautiful vessel surrounded by scrap wood and tools. An park employee named Karnell came out of his workshop and shared with me the background of this boat, the Eva B. One day a man walking along Hyde Street Pier immediately recognized the Eva B. It had belonged to his family (the Batchelders) between 1936-1950 and was now undergoing restoration by the park. Delighted that part of his family's past was being preserved, the man later returned with photos of the Eva B to show the park's boat makers. These images proved to be invaluable to the restoration process as they gave clues to the boat's original construction and appearance. Karnell shared an album of these photos. Nearly every picture was filled with laughs and smiles. Clearly the Batchelders had many fond memories and adventures on the Eva B. Built in 1936 by Manotti Pasquinucci in Sausalito, it had been used by the Batchelder family of six for summer vacations and fishing trips in the San Francisco Bay and Delta for fourteen years. Between two full time boat makers and thirty volunteers the restoration will take two years to complete. Rather than be swept away by the currents of modernization, this historic vessel is being preserved for all to enjoy.